Thanks for that bit more detail, poisson. Where’s Portnoy with his official updates? This young pretender has dodgy maths! Check out the online calculator if you’re not sure poison. Also, wow, didn’t realise England were so ahead of the other NH sides. 22 winning games on the trot, Cyril. You didn't realise? Round 2. 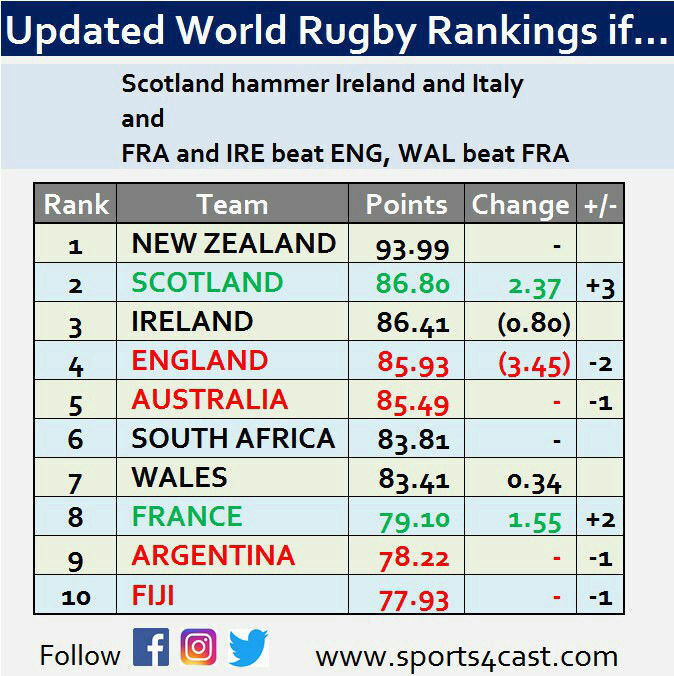 Ireland beat Italy, England beat Wales – no change in eithers ranking points as >10 pts difference. Lets presume Scotland win as that then gives them a better points score for next round. Round 4 Ireland beat Scotland, England beat France –(and Wales beat Italy) England – no change as France have too few points. Ireland get 0.22 pts. Now if Ireland beat England by 15 pts or less – calculated ranking points are England 89.68 Ireland 89.13. However if Ireland beat England by more than 15 points – calculated ranking points are England 88.84, Ireland 89.98. Using algebra (I think) I have calculated that Ireland go ahead of England if they are within 5.57 ranking points at the time of their game and they beat England by more than 15pts. They would need to get to within 3.25 pts to go ahead of them with a lesser win - which they can't achieve with maximum wins in all their other matches up to that point. poissonrouge wrote: Using algebra (I think) I have calculated that Ireland go ahead of England if they are within 5.57 ranking points at the time of their game and they beat England by more than 15pts. They would need to get to within 3.25 pts to go ahead of them with a lesser win - which they can't achieve with maximum wins in all their other matches up to that point. Nope - it doesn't work that way. The maximum you can lose or gain from a game is 3.0 points if the rating difference before the game is 10 and the lower ranked team wins by more than 15 (that can double to 6.0 points at the RWC finals - but not for the 6N). 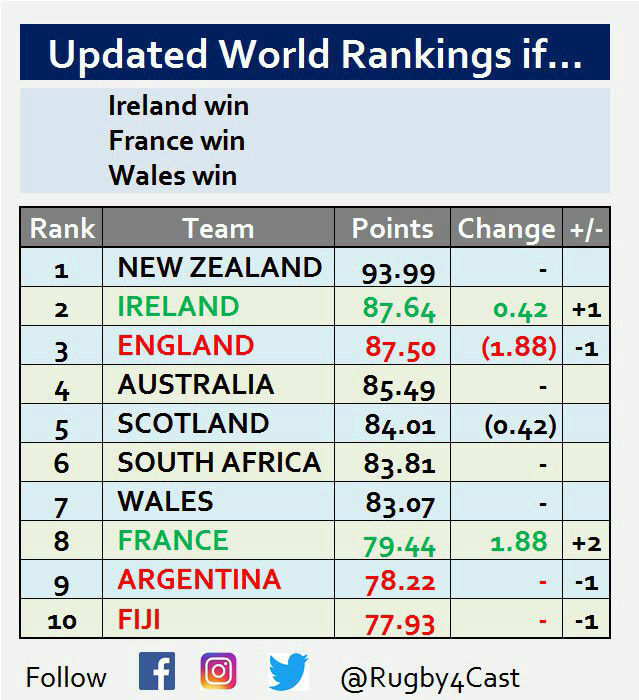 If two teams are equally ranked it's 1.5 outside of the RWC, and each 1 point difference in ranking (allowing for the home adjustment) is an additional 0.15 points at stake. Ireland can overtake England with a straight win if they are 1.44 or fewer points behind, or with a 15 point win up to 2.29. The current gap is 4.01 points. England can't win points from Wales, only lose them (home advantage). Will be able to get something by winning in Edinburgh; and may or may not be able to get something by winning in Paris. If they lose all their matches, they would probably lose about 4 points in total; winning them all is probably worth a little over half a point. Ireland can't get points off Italy, can get a bit of a point off Wales, and a bit less off Scotland. If England have a total collapse, Ireland could already be ahead by the last weekend. If both sides go in unbeaten, then Ireland can close the gap but not overtake England. The maximum you can gain or lose is 3 points. That is if there is a maximum difference between ranking points. 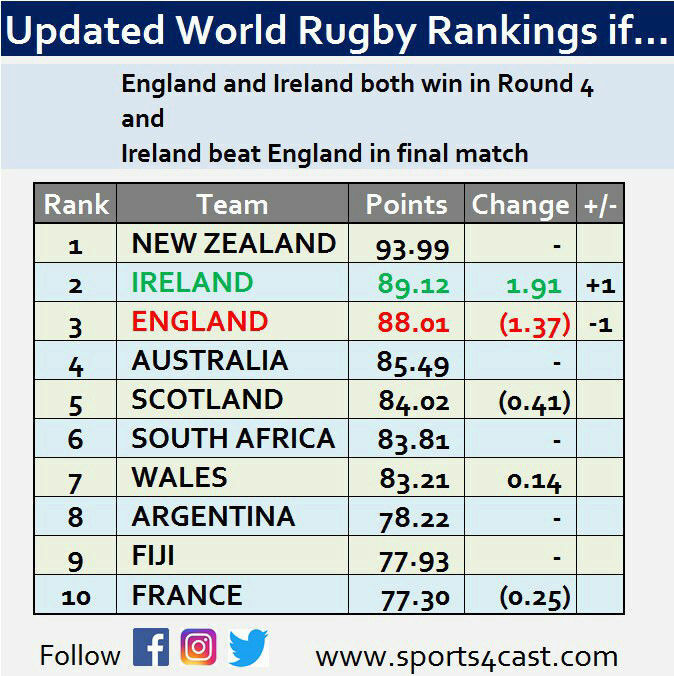 If there was a maximum difference between the two then if Ireland beat England by more than 15 points - Ireland gain 3 points and England lose 3 points. So there is a 6 point swing. 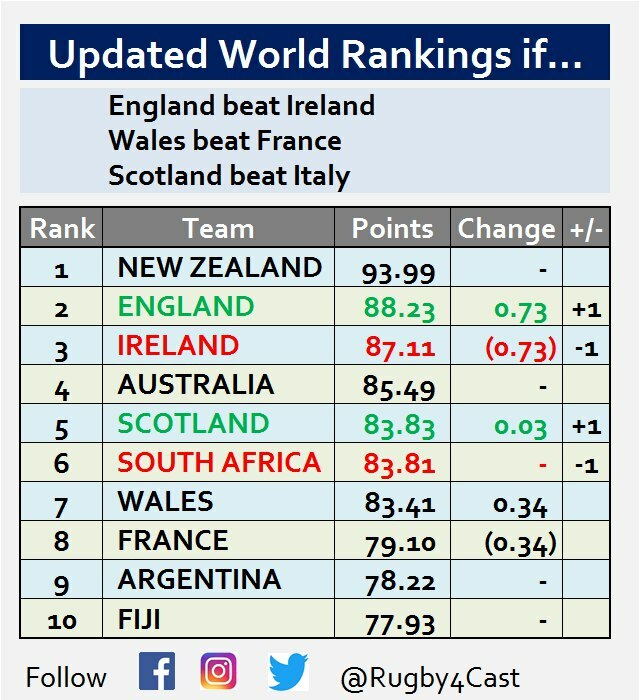 If two teams are equally ranked it's 1.5 outside of the RWC, and each 1 point difference in ranking (allowing for the home adjustment) is an additional 0.15 points at stake. The actual calculation of the points difference required is given in the spoiler in my last post - it comes to 3.25 for a plain win and 5.57 for a big win. ah yes - had forgotten that it cuts both ways. There's a lot at stake in that game, then. do scotland get good points for beating England? And if the next time round Scotland repeat their success, they will jump to 3rd. 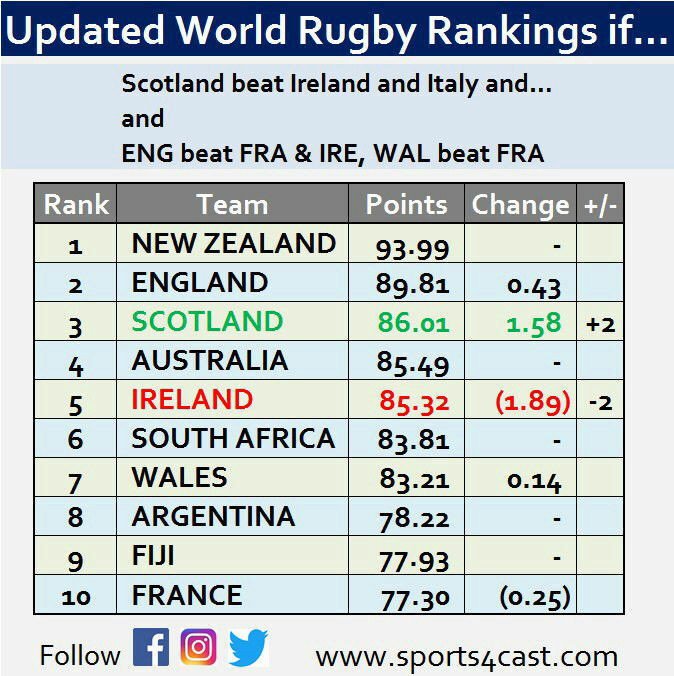 And if Scotland could beat Ireland by more than 15 and England lose to France by more than 15 - Scotland would jump to 2nd! There's a dream for the Scottish fans. However if Ireland win and England lose - Ireland go to 2nd. And Scotland stay in 5th. If you want any more scenarios played out give us a shout! Here's some potential scenarios from this weekend and their ranking implications. Yup! But whoever wins in Twickenham next weekend will be number 2.
you have scotland behind SA but on more points? Sorry - put the points into last weeks table - scotland move up one position at SA's expense. Points are right order wrong - Scotland gained three hundredths, but were only one hundredth behind SA. Thanks - it makes better reading for Scotland. Looking at the table I'd say it looks about right in terms of where the teams are. NZ are going to walk to another world cup victory at this point as I can't see Ireland maintain their form away from home in humid conditions. So what are the rankings after this weekend ? 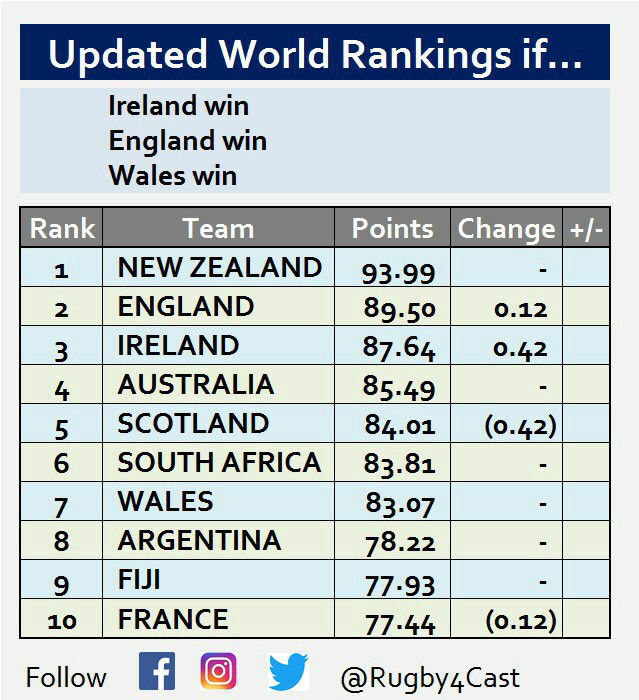 If the results from the weekend are repeated for the next 2 weekends (ok Wales only have one more game v Argentina) then pecking order is NZ. AUS, IRE, WAL, SA, SCO, ENG, FRA. A lot to play for this weekend. Can England get back up the rankings? Or how low can they go? What about Ireland and Wales - or Australia and South Africa? I calculated on 2 hypothetical scenarios at opposite ends of spectrum - either Australia, England and Argentina all won by more than 15pts or all lost by more than 15 pts. 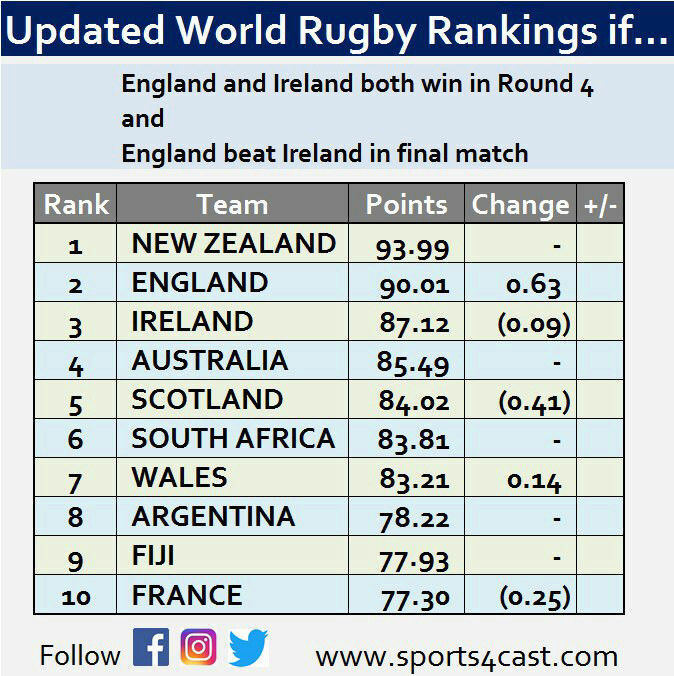 England could creep back to 3rd if they win massively and Ireland lose massively - in which case Australia and England both pass Ireland. Wales would drop back below Scotland and Argentina could pass France with a big win. 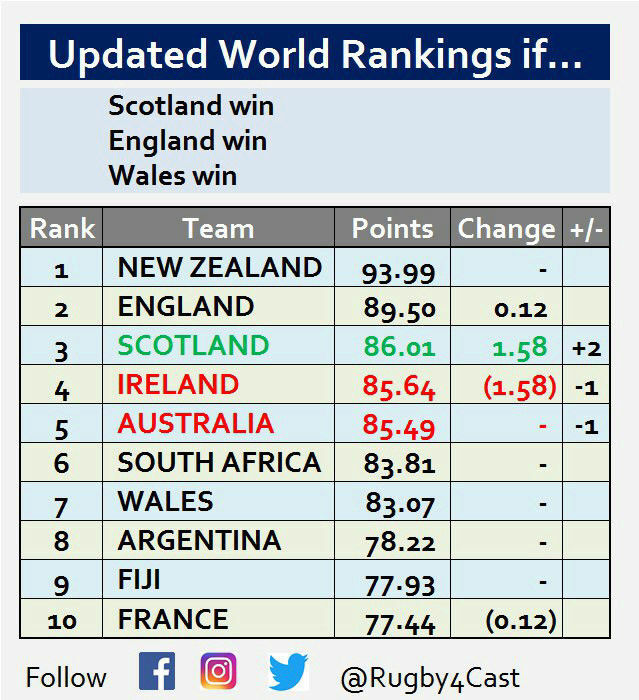 Still waiting on Wales result - if they win they move to 3rd, (with Australia, South Africa, England and Scotland 4th 5th 6th and 7th) but if they lose they drop to 7th (with Australia, South Africa, England and Scotland above them in that order). NZ and Ireland unchanged at the top. Yeah we aren’t 3rd best in the world for sure. 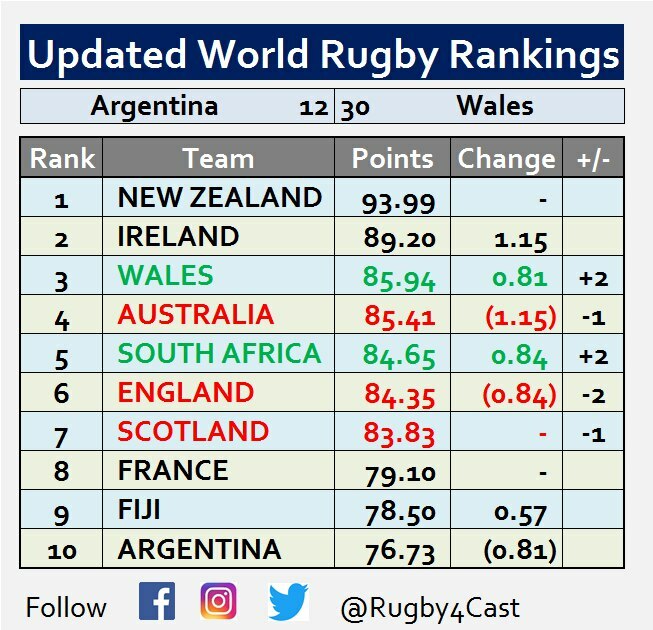 The rankings had us above Arg first hand and as we beat them fairly convincivly, twice, they’re a little accurate in that regard. 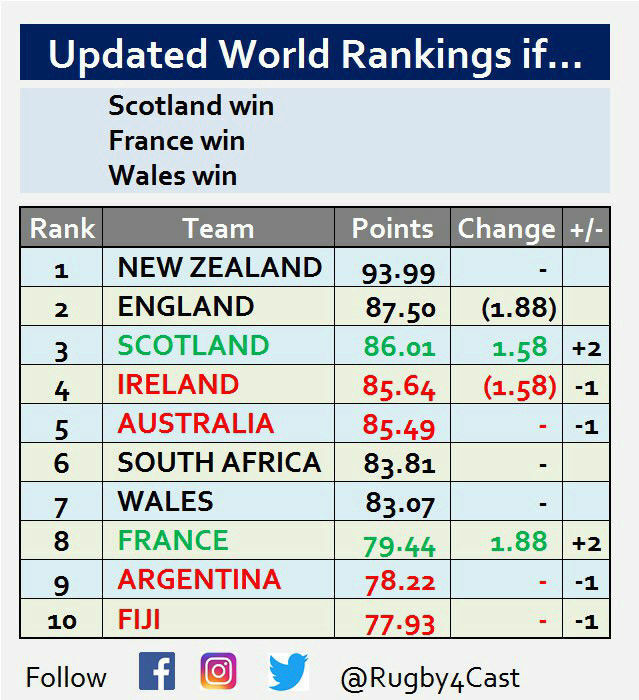 At the time SA and Scotland were ranked above us I think, and I don’t feel that they were better than us at the time and right now. 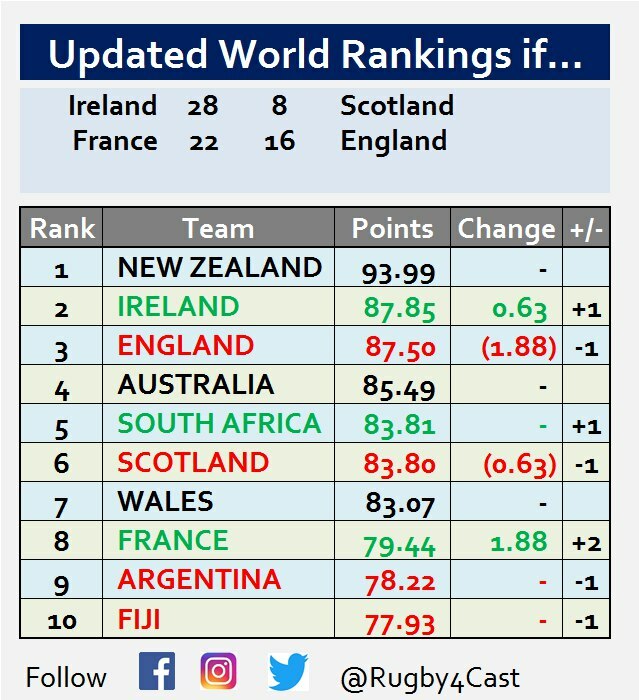 Fortunately for England who were staring a drop to 7th if they lost next week, there are now over 4 pts separating positions 3 and 7 - Scotland losing to US meant a maximum ranking point drop of 2 points for them. So England can't now drop to 7th regardless of next weeks results. Let's say the French get things right and get 15 men on the field like a real team for a change. Let's say the All Blacks have a big off day (they won't ) But to continue the dream for a little while, let's say the French marmalise New Zealand in the final test. Beat them by more than 15 points. Let's say Ireland beat Australia by roughly the same margin. How far off would Ireland be from Number One then? And then we could wait for one more beating for the ABs by either Australia, South Africa or Argentina in the next few months and we be...................... *gasp* Number One side in the world leading into the Autumn series???? NO!!!!! Where's our Underdog status gone?? Gone to the feckin' dogs! The IRFU are ruining our culture! Ireland beat Australia by more than 15 pts - they gain 1.38 pts and climb to a ranking score of 90.58. All change after the weekend. Home losses for Australia and NZ means a 2 point loss for both and a 2pt gain for Argentina and the Boks. Anyway, delighted to see we've now risen from 2nd to Almost 1st!!! What a jump! Wales in 3rd. Hmmmmm. It doesn't feel like we should be, but as others constantly remind us - "the rankings don't lie"! SecretFly wrote: poissonrouge is Mrs P? We go way back to earlier in the decade or maybe even a touch earlier... when I was 'working' under my Linebreaker alias. Yeah, I remember the Linebreaker name. A lot of us go back to earlier in the decade. Where the hell does time go? First it walks in the opposite direction to you and then it starts running! The Oracle wrote: Wales in 3rd. Hmmmmm. It doesn't feel like we should be, but as others constantly remind us - "the rankings don't lie"! Now that you mentioned that and this is not the place for it I know, but why the hell not - the rankings page is so quiet, it needs controversy. No, I was thinking about the worth of a try not too long ago and I really do (joking aside) think it's now demonstrably undervalued. A player can pull off a sensational solo try (like Jordan Williams for the Dragons at the weekend) and it only takes two so-so penalties and some casual kicking to get the other team almost back on terms - just the one point behind. It's like that classic tale Mohammed Ali told when he laughed at old horror movies, where the heroes have to run at high speed to escape the monster who no matter how slow it plods is always just right behind the sprinters in every shot. I think a try should get an extra point.... 6 - plus the conversion = 8 The campaign starts here! Joey got a lot of explaining to do! He goes back decades with a man he thought was a woman? SecretFly wrote: Anyway, delighted to see we've now risen from 2nd to Almost 1st!!! What a jump! 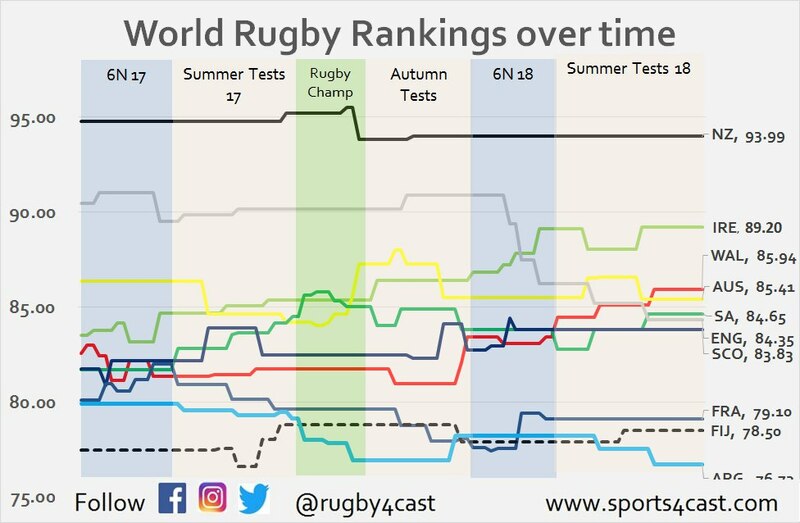 The All Blacks "problem" is they are so far ahead of South Africa that even if they beat them when they play them again - they can only reclaim less than half a ranking point. Winner of Australia/Boks is 5th the other is 7th. Boks and Australie - as stated above winner between them goes to 5th other goes to 7th. So I trust you are all suitably confused by that posting!